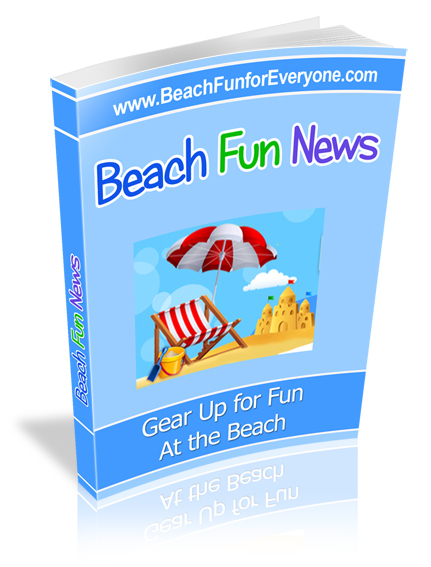 Beach chair accessories still come in handy even though many of today's beach chairs come with coolers, headrests, and towel bars. You may find yourself getting so comfortable there won't be any reason for you to get up. 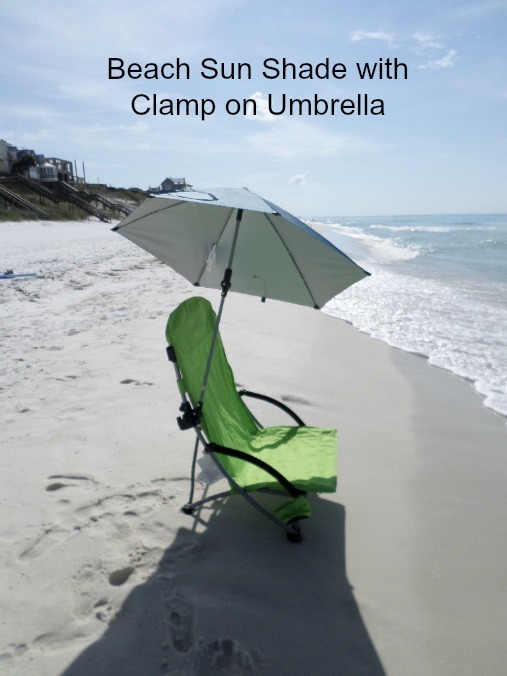 A clamp on umbrella always comes with us to the beach. This means I can move my chair anywhere I want to and still have shade. Even though we put up a large beach cabana tent or pop up tent, I like to sit close to the water and let the waves wash up on my feet. 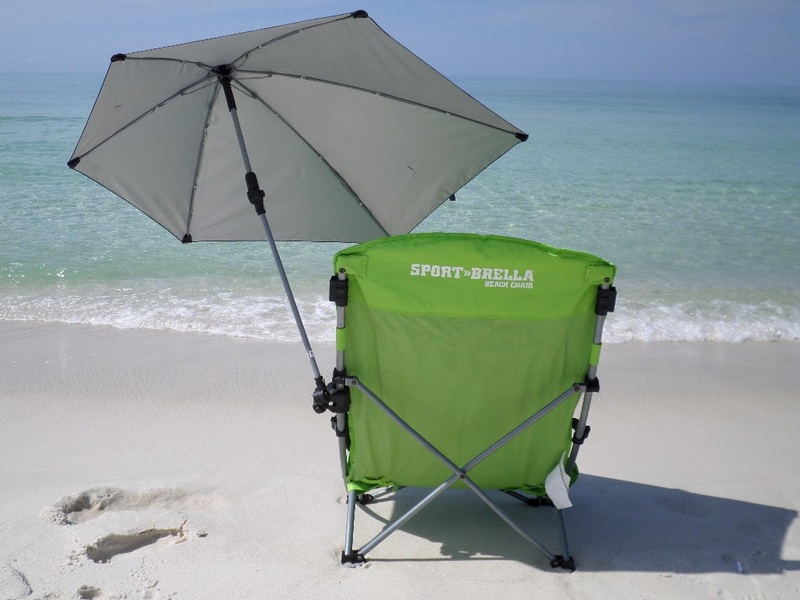 Lightweight and easy to carry, this beach chair accessory makes it possible to keep my feet in the water and my face in the shade. The umbrella can swivel and adjust to any position - so no matter where the sun is you can have your own little piece of shade. Easy to attach to just about any chair arm or head post, you can have instant shade or remove it for instant sun. The clamp simply screws on to the post with a simple twisting motion and is removed just as easily. It is well worth the money and free shipping if you are a Prime Member. This beach chair caddy is the perfect companion to your lounging experience. 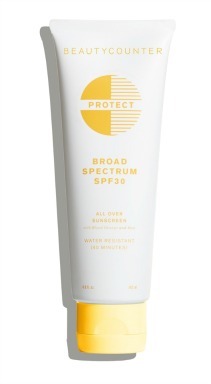 All of your beach essentials are handy, easy to find and protected from the sun and sand. A large zippered pocket holds a Kindle Paperwhite or other type of tablet. A mesh pocket holds a small water bottle or a tube of sunscreen. Put your cell phone in another pocket to keep it handy but away from the sand. It simply attaches to the arm of your chair with adjustable straps that buckle. A shoulder strap can be used to carry it. 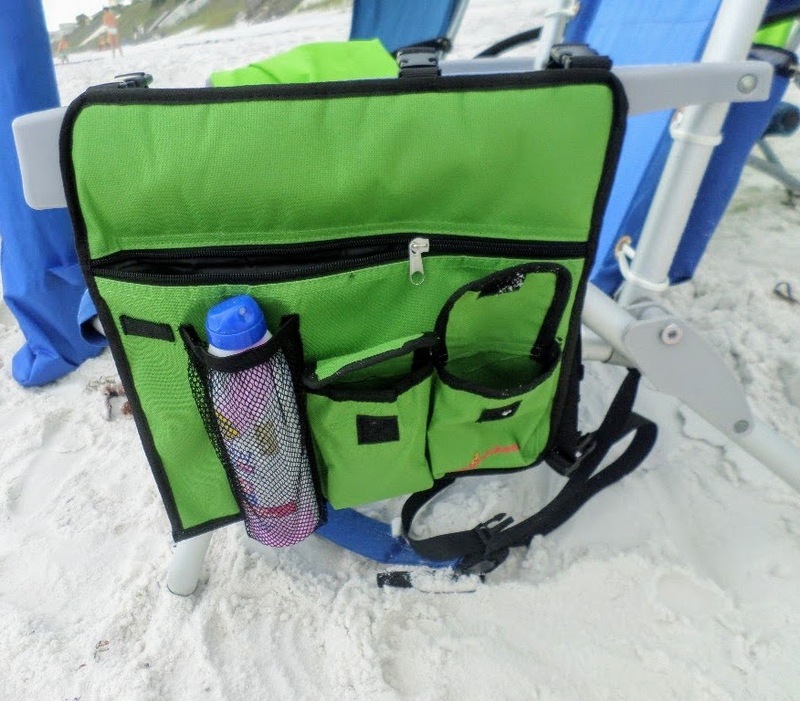 Keep your valuables and electronics handy and safe from the sand all in one place. Most beach chairs have pathetic beverage holders - often just a flimsy piece of netting or a cup holder that' doesn't happen to fit your choice of favorite beverage. That's what I love about the Spikers - just push the spike into the sand next to your beach chair. It doesn't matter what size your water bottle is or what kind of can you have - it will fit and stay put in one of these holders. Made of heavy duty molded plastic, these Spikers keep your drinks out of the sand. Not just for drinks either, place your sunglasses, cell phone, sunscreen or mp3 player in them as well. Sometimes there just isn't a breeze, so you bring your own with this portable clip on fan. A rechargeable battery makes it convenient so you don't need to keep a supply of batteries on hand. 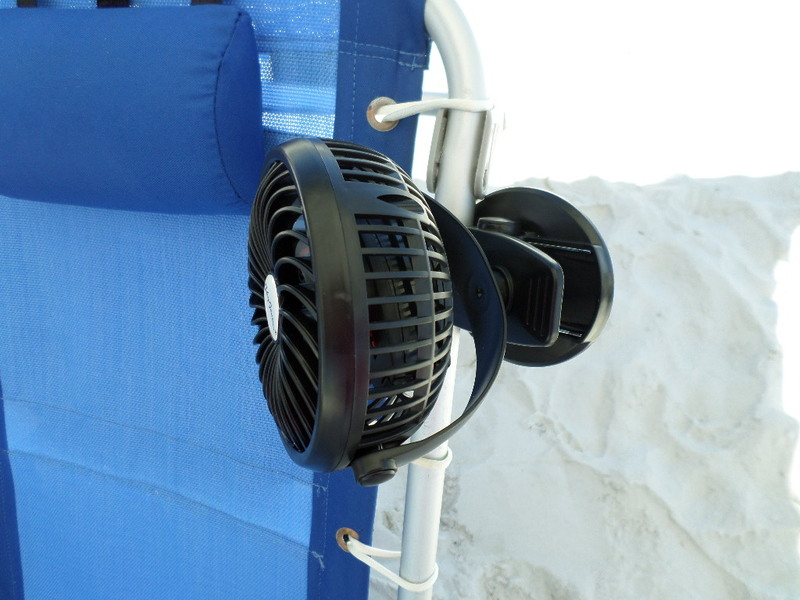 Just clip it onto your beach chair and you'll feel instantly cooler. There are a lot of advantages of using a beach chair cover. In case you don't know what that is, it is just what it sounds like. It is a cover, made of terry cloth or a quick dry fabric, that you slip right over your beach lounge chair. Why bring one to the beach? Many beach lounge chairs at hotels, resorts or apartments are made of aluminum and vinyl. The vinyl gets sticky and hot. A soft terry cloth material is soft, absorbs water and isn't sticky - not only is it more comfortable it is more sanitary - it's especially appealing if the previous user had just put on a ton of sunscreen. In addition to comfort, you can also protect your chair. Just as the sun heats things up, it can also cause damage. Your chair can also be damaged by the oils from your body and lotions you apply to protect yourself from the sun, as well as the sand and salt water that may be stuck to your body. Another advantage of using a beach chair cover is that you can change the look of your beach chair any time you like. Maybe your old fabric has faded or you don't like the design of the fabric any more. Maybe the texture doesn't feel comfortable. No matter what aspect of your beach chair's appearance you are no longer happy with, a cover is a simple solution. Just as furniture covers can change the appearance of your furniture at home, they can do the same thing for your beach furniture. When your cover gets dirty, just slip it off and throw it in the wash. This is much easier than scrubbing grime off your chair, especially fabric chairs. Some stains are impossible to get out of a chair, but come off like nothing in the wash. And if the stains are too bad, just buy a new cover. It's much cheaper than buying a new chair. Who goes to the beach without their cell phone, Kindle, ipod, or camera? Now you can keep your electronics handy for that special shot or for a quick phone call. Beach chair covers have pockets where you can store your things – sunglasses, sunscreen, or maybe a watch. But, that's not all. Many come with special compartments for your iPhone, or iPod – even though it is difficult to see the screen on these devices in direct sunlight, you probably take yours with you anyway. There are pockets for regular books, too. You might be asking yourself – why not just use a towel? For one, towels don't have pockets. But, the most important fact is that towels slip and slide all over the place. A cover fits snug to your chair and won't fall off every time you move. Plus, the ties keep it in place in case a sudden wind whips up. While you are running down the beach gathering up your hat, book and towel, your cover will stay nicely in place, waiting for your return. Beach towel clips keep your towel secure so it doesn't blow off your chair. This handy set of 8 clips come in pairs of bright colors. A strong spring and a mouth that opens wide makes it applicable for other uses like securing a tablecloth to a picnic table.